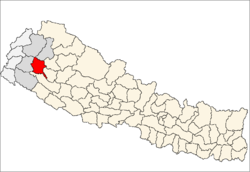 Achham District (Nepali: अछाम जिल्ला Listen (help·info)) is a district in Nepal. It is in the Seti Zone. Mangalsen is the district headquarters of this district. ↑ "National Population and Housing Census 2011(National Report)" (PDF). Central Bureau of Statistics. Government of Nepal. November 2012. Retrieved 10 October 2016. This page was last changed on 10 October 2018, at 11:19.